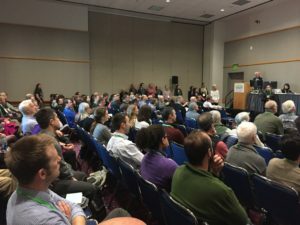 The Ocean Observatories Initiative Facility Board hosted a town hall at the February 2018 Ocean Science meeting in Portland, Oregon. View Lightning Slides presented at the meeting. Over 80 people attended the workshop. The Town Hall was Tuesday, February 13, 2018: 12:45 PM – 1:45 PM Oregon Convention Center, Room F151.